Previously, on MinerBumping... Agent Bob the Fourth cut a swath of goodness through the Solitude region. Even when faced with heavily tanked miners, Bob prevailed. 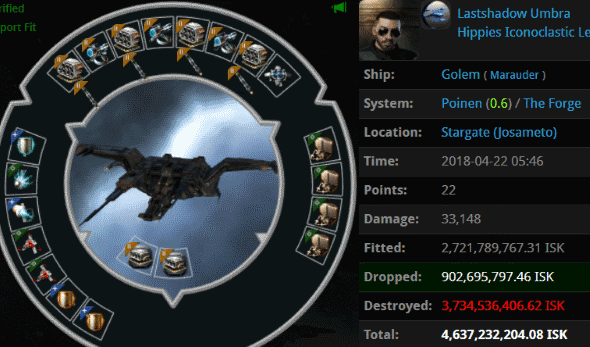 Orca pilot Yanul Damar thought he could hide behind the block of EHP granted to him by CCP--until Bob's bumping ship sent him flying out of the ice anomaly. 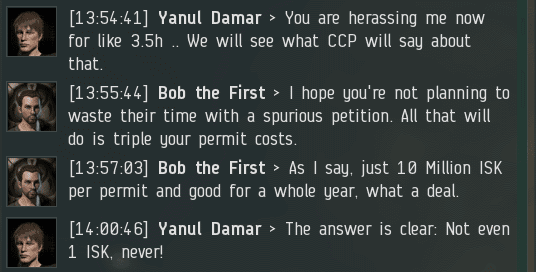 Yanul couldn't think of a way to fight back, so he threatened to get CCP involved. Unlike most space lawyers, Yanul showed his work, citing an old thread on the official EVE forums for support. The thread in question was authored by GM Karidor. Dating back to January 2013, Karidor's thread (which was a follow-up to CCP Falcon's thread from a few months earlier) was one of the New Order's great early victories. 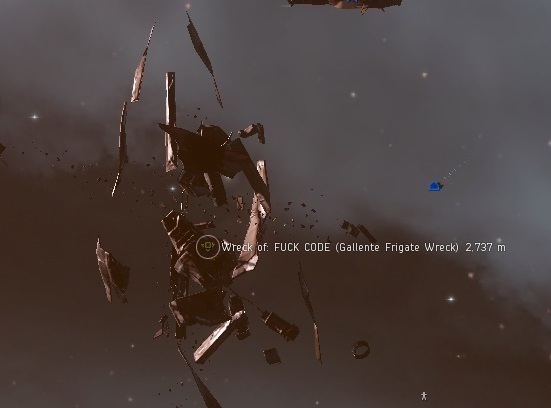 Several months after the dawn of the New Order, CCP had been forced to break its studious silence about the Code and address the topic of miner bumping in a special, pinned thread. 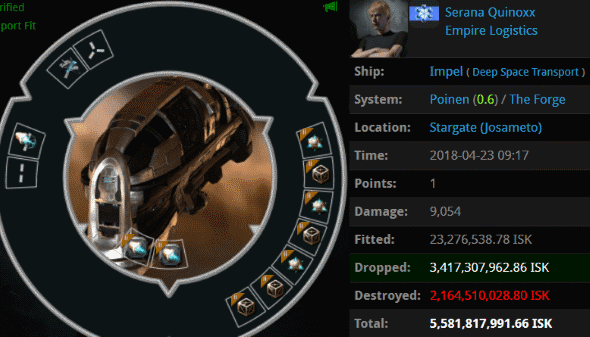 CCP considers the act of bumping a normal game mechanic, and does not class the bumping of another player’s ship as an exploit. However, persistent targeting of a player with bumping by following them around after they have made an effort to move on to another location can be classified as harassment, and this will be judged on a case by case basis. If the victim just moved next door, that could still be interpreted as 'general area of operation', if the miner starts changing regions and is still being followed around by the same person that keeps bumping in a regular manner then the intent is pretty clear. 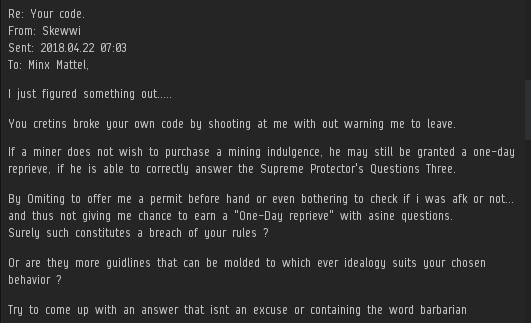 Three years after the ruling, CCP CiD edited GM Karidor's post to say that it was outdated. 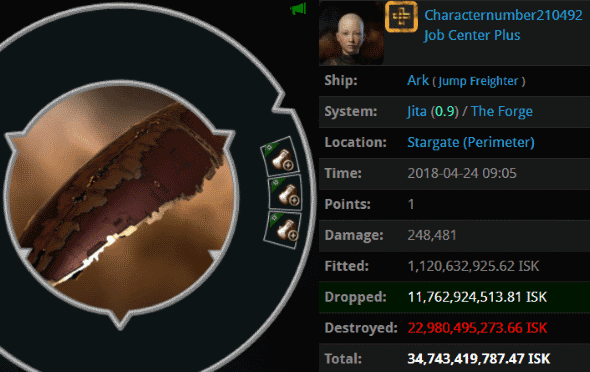 CCP never bothered to come up with a new rule, though. 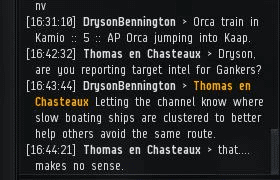 So Yanul's proof that bumping was against the rules consisted of a pro-bumping thread disavowed by CCP. Bot-aspirants never were good at checking their own cites. Agent Bob felt it was safe to ignore Yanul's space lawyering and continue to bump the unruly miner. After the Orca was sent beyond effective range, Bob proceeded to bump other miners in the area. The New Order's bumpers are notoriously good multitaskers. On occasion, Yanul returned to his keyboard, hoping that Bob had left--only to be bumped away again. Yanul couldn't believe it: Hours later, Bob was still at it! The Agent rendered the system unusable. Yanul could've left, but he didn't want to be told what to do. 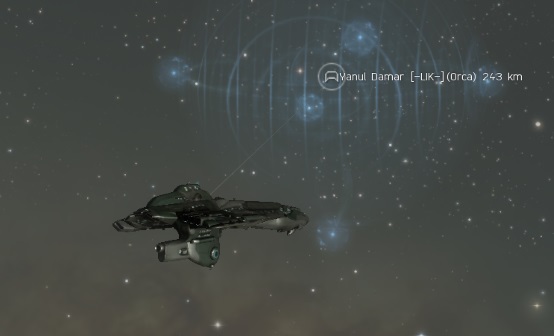 CCP never came to Yanul's rescue. His petition was probably collecting dust in a bin with thousands of other complaints about miner bumpers. Finally, after nearly four hours of on-and-off bumping, the miner logged off in disgust. His day had been wasted. Agent Bob was triumphant once again. As the Goofuses stood down, Gallant miners stood up to buy permits. Bob formed relationships with the local Solitude communities and received a steady stream of intel from good citizens. They opposed the tyranny of bot-aspirancy, too. The legend of Bob grew. Rebel miners spoke of him often. The very fact that they were speaking at all--engaging in the game instead of going AFK--was a sure sign of progress. The whole region was transformed in substance and feel. As for Agent Bob, he was a celebrity, treated like a rock star wherever he went. 'Twas the power of the Code at work. The mighty CODE. alliance just can't stop scoring victories. This week was victory after victory after victory. If no one can stop us--and the evidence is clear that they can't--then where will it end? In more victory, of course. 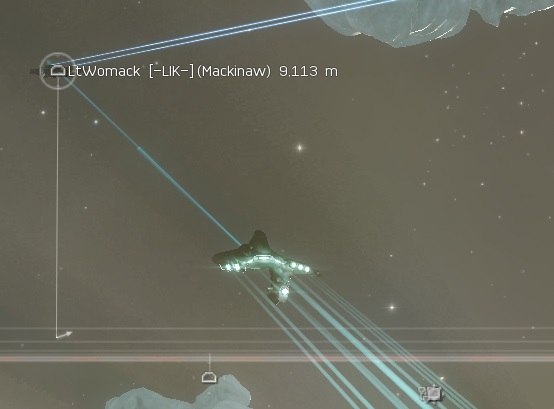 Let's start with one of those "ships that can shoot back": Lastshadow Umbra's 4.6 billion isk bling marauder. 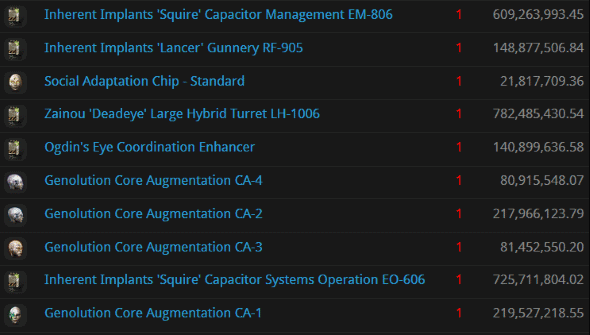 Isk doesn't translate into combat effectiveness, however. No matter how much he spent on weapons and defenses, Lastshadow was, at his core, a carebear. He was no match for elite PvP'ers like Agents Ralliana, Luna Nightblood, and Underpaid Ship Mechanic. ...And lest our Agents be accused of picking on defense-ful combat ships, Serana Quinoxx's unarmed, defenseless hauler met the same fate. For Serana failed to obey the Code, and that meant his ship was destined to become a wreck. He was killed by the trio that killed the Golem: Agents Underpaid Ship Mechanic, Ralliana, and Luna Nightblood. Freighters have been dying in unprecedented numbers, yet they won't stop trying to AFK their way through Uedama. 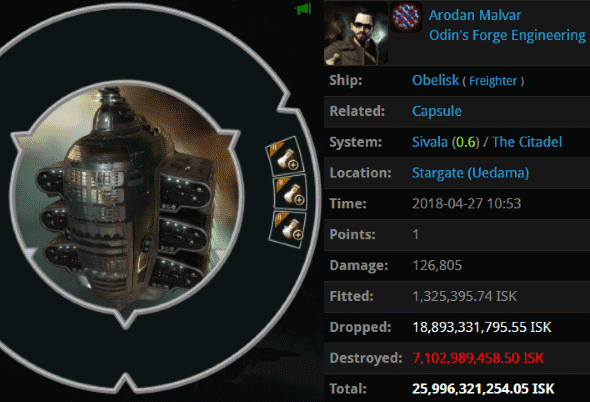 Arodan Malvar spent nearly 26 billion isk on his reckless gamble against the power of the Code. He lost, of course. Agents Little Miss Scary, Sherri Rozei, Little Miss Bossy, Little Miss Naughty, Little Miss Stubborn, Helen Mary Leese, Little Miss Bad, Trump The King, Giselle Rozei, Ruby Rozei, Lagatha Rozei, Shanade Rozei, Christine Rozei, Katy Rozei, Baron Rozei, Ivanka Rozei, Tawny Rozei, holdmybeer, and Lobo El Lobo bet on the Code--and won big. Always bet on the Code. Characternumber210492's name sounded a little bot-aspirant to our Agents, so they investigated him. 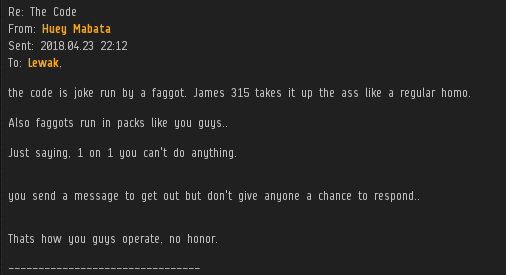 He was flying a 34 billion isk jump freighter with ORE cargo expanders--and he had no permit. The results of the investigation were conclusive: Characternumber210492 was a bot-aspirant. 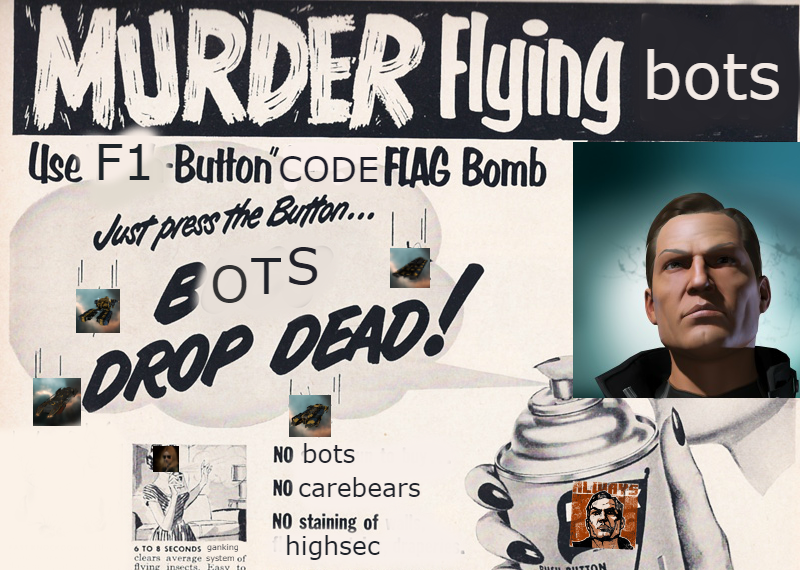 The kill order was given. Agents Tax Collector Aruka, Tax Collector Kimi, Taxman Daniel, Tax Collector Kittens, Tax Collector Larry, Pod Destroyer Molly, Tax Collector BokChoy, Tax Collector Richard, Tax Collector Max, Tax Collector Stroheim, Tax Collector AynRand, Tax Collector Yuna, Tax Collector Shardani, Tax Collector Hill, Tax Collector HongMei, Tax Collector KarlMarx, Tax Collector Buck, Tax Collector Fuemi, Tax Collector Rachel, Tax Collector Alison, Tax Collector Otto, and Kill The Innocents carried out the order and made Jita a better place. This is the best way to deal with Citadels, I find. Ecclesiast was a relic of the past: He thought he could autopilot a rookie ship through highsec and not lose his pod. Agent Pod-Goo RepoWoman, by contrast, is a symbol of modern highsec life under the New Order. 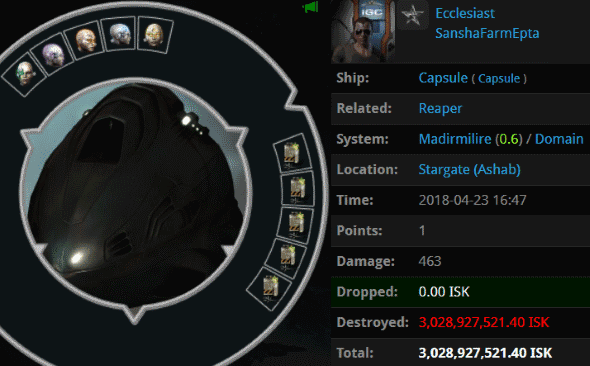 She removed 3 billion isk worth of implants from the regressive carebear. I'm pretty sure you don't need all of that to pilot a rookie ship. Now watch Ecclesiast complain about being a new player--or a "newly returning" player. 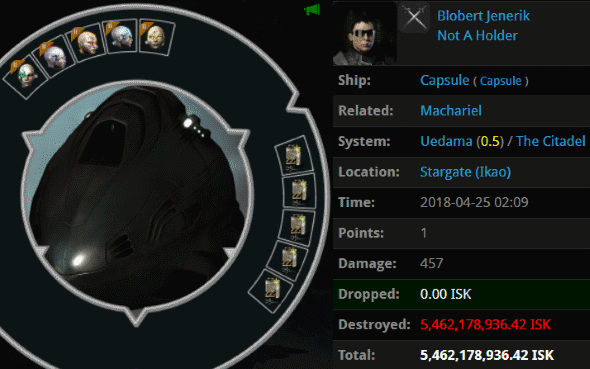 Incredibly, Blobert Jenerik managed to lose a pod almost twice as expensive as Ecclesiast's. Blobert's crime was even more absurd. He attempted to use a Machariel to counter-bump our Agents while they were busy preparing to kill another target. 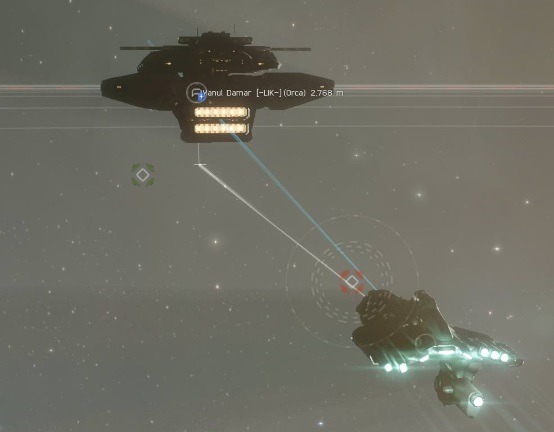 Not only did Blobert fail to save the target (a 6.5 billion isk Bowhead who died a few minutes later), the would-be Anti-Ganker managed to get himself killed in the process. Then he was podded by Agents Joshua Kusion and Katy Rozei. Silly rebels. If you want to spend your money on something useful, start with a mining permit. That's right, CCP Guard, it means it's time for another edition of the Highsec Miner Grab Bag! Earlier this week we read about DrysonBennington, who is always thinking up new ways to fail to stop the New Order. Even his fellow Anti-Gankers mock him for this. And here's another MinerBumping follow-up: Skewwi of the "Reading Dead" series is still trying to space-lawyer his way to reimbursement. MinerBumping publishes miner tears, which lead to more miner tears when the miners read MinerBumping. 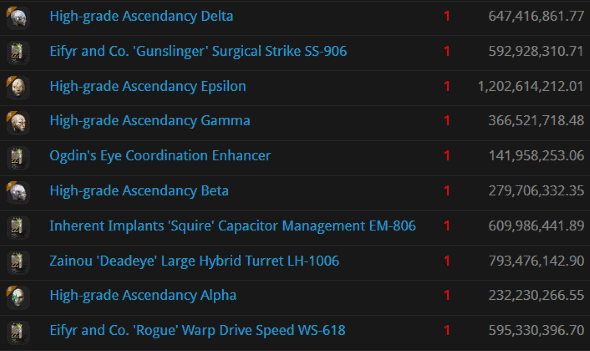 The New Order makes the most of every resource in highsec. Adallia Ataria is a typical anti-Code intel chief: She warns people about gankers, and then gets ganked by them. 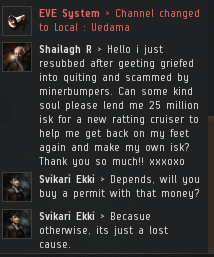 Some bot-aspirants try to hide behind a permit and a 10 million isk payment. These frauds then violate the Code and get ganked. How do we know they were bot-aspirants all along? 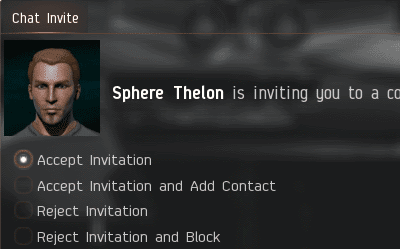 Well, EVEmails like this one certainly aren't written by Gallant miners. The mighty CODE. alliance must be the best alliance in the game--we have the most execrable enemies. Candy Angel presented our Agent with an interesting dilemma: What should a miner do if her baby cries? Should she obey the Code, or should she go AFK to give the baby milk? Luckily, the Code is imbued with Solomonic wisdom. (And no, I don't mean to suggest splitting the crying baby in two). The answer is simple: Either let the baby cry, or let the miner cry. Ragnar Lothbrookes insisted that Agent Ralliana made a big mistake by ganking him. If so, the negative consequences were overshadowed by the loot Ralliana scooped. Presumably Ragnar meant that it was a long-term mistake of some sort. Shaila Starflare is wrong. The Code doesn't say you can't shoot new players, so how is it not okay? Besides, I lost my first ship when I was a new player, and look how great I turned out. Huey Mabata bemoans the fact that our Agents "run in packs" with their fellow Code enforcers. Gee, I wonder why Huey doesn't have a bunch of allies of his own? Classic rule of highsec etiquette: Always ask a beggar what they plan to do with the money. Two choices, carebears: Get with the Code or get wrecked. Get your glasses and thoughtful looks ready, readers: It's time for another New Order art mini-gallery, courtesy of Agent Neuro Cesaille. Some people say Code enforcers are a poison. 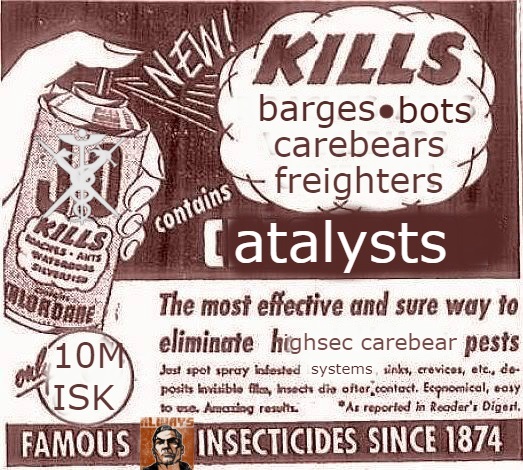 Actually, the carebears are highsec's poison. We are the cure. "Why do they hate us?" 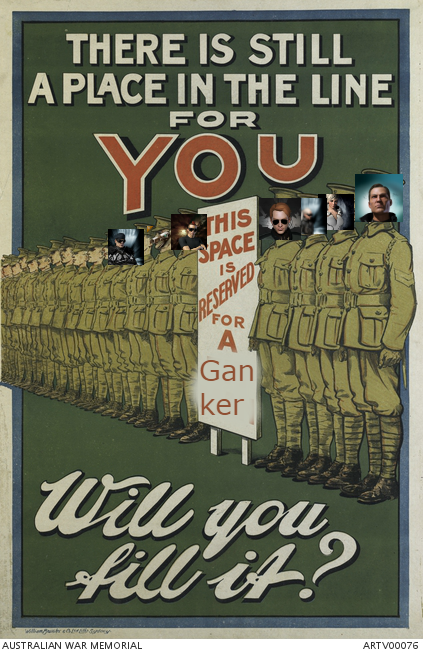 ask the rebellious miners. Well, it might've been more difficult for them to attract the hatred of the EVE populace, had the miners not abdicated their humanity in favor of bot-aspirancy (and in many cases, full-blown botterdom). The rebels accuse us of conformity. "You all say the same things, you quote the same things, etc." Conformity? Not so, for our Agents enforce the Code in such a wide variety of ways, like the blooming of a hundred different flowers. It's not conformity; it's community. Samantha Ivainesu's generosity is so typical of the New Order. 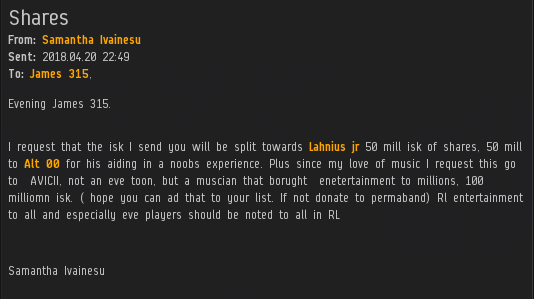 Oh, and by the way, how much isk did the Anti-Gankers dedicate to the memory of AVICII? That's right, you guessed it--a big goose egg. No surprise there. Previously, on MinerBumping... When Agent Bob the Fourth went to work cleaning up the Solitude region, his compassion was on full display. He gave unlicensed miner Collie Dogz repeated warnings about the need to buy a permit. Collie wouldn't listen. But when the inevitable occurred, Collie blamed Bob. Instead of blaming himself, Collie cursed the Code and all who enforced it. 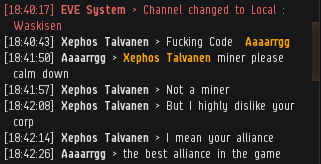 A highsec miner who didn't know how to take personal responsibility. What a shock! Collie considered himself completely defenseless. 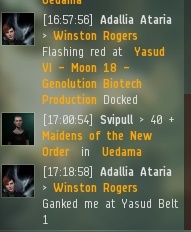 Actually, he'd been armed with at least 10 million isk, so he definitely had the power to prevent the attack. 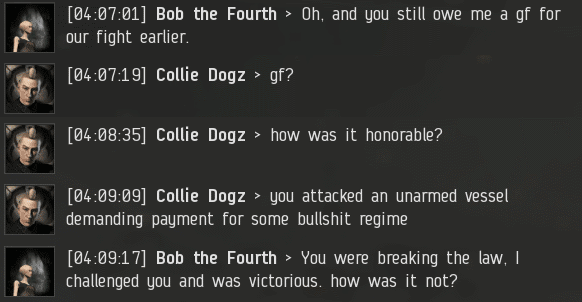 Agent Bob name-dropped the Saviour of Highsec. Collie was triggered by it. Bob took careful note of this development--it was an important clue. The miner felt he was entitled to reimbursement isk for his dead Retriever. If this was Collie's way of trying to ask for a handout, he was as bad at panhandling as he was at mining. Collie's parting words left little hope for a diplomatic agreement between the two. Yet Bob was still confident that the story would have a happy ending. Though the miner had already excused himself from the conversation, he couldn't resist winding himself up with another anti-Code tirade. Maybe expelling a little extra venom would help the miner sleep better when he finally did log off for the evening. Collie quit without buying a permit, but Bob was right about the happy ending: He never saw Collie mining in Solitude again. Bob's Code enforcement operations continued. Eventually, he came across a nest of rebels mining in an ice anomaly. They used a group of heavily tanked Mackinaws and an Orca. Bob didn't have the firepower to defeat them. Or did he? Bob started bumping them from the ice anomaly. First the Mackinaws, and then the Orca, piloted by Yanul Damar. They may have been tanked against antimatter, but they certainly weren't tanked against the almighty bump. Our Agent gleefully sent the arrogant mining gang soaring into deep space. How would they react--when they finally stopped being AFK, that is?